State Sen. Ken Yager and Deputy Governor Jim Henry recently visit the Expo Center at Roane State to celebrate the installation of new fans. 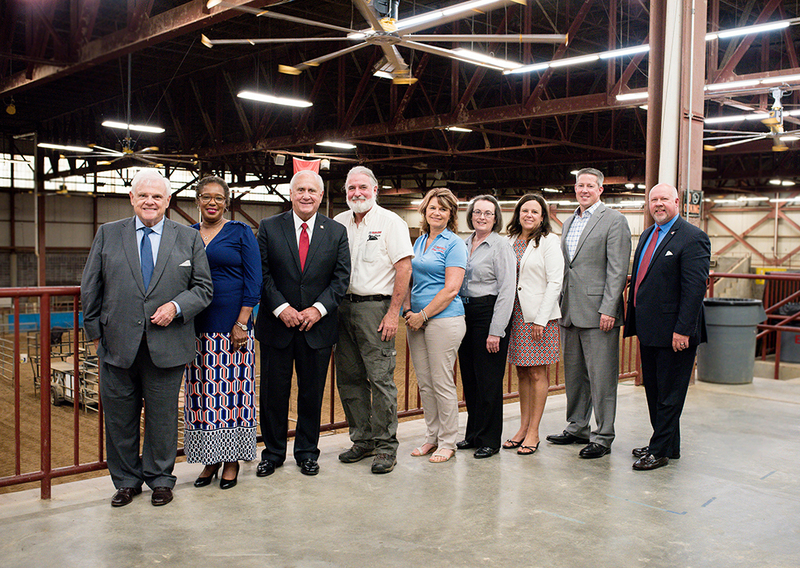 From left are Sen. Yager; Vanessa Hatcher; Deputy Governor Henry; Roane State staff Stan Starkey, Diane Cox, and Tamsin Miller; Pam May and Wade Creswell with the Roane Alliance; and Roane State President Chris Whaley. Not pictured is Roane State grant writer Deb Miller. Gigantic fans have been installed in Roane State’s Henry/Stafford East Tennessee Agricultural Exposition Center, cooling things down for both participants and the audience. 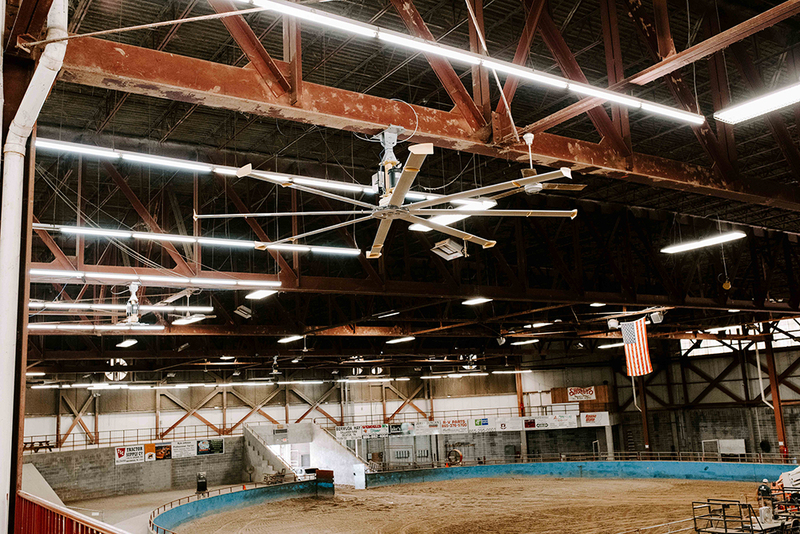 Five fans that are 18 feet in diameter have been put in place over the arena floor, while two additional fans 14 feet in diameter are overhead both in the seating area and the livestock holding area. The state Department of Agriculture and the state Department of Tourism partnered to award a $75,000 grant to Roane County to support the $99,000 project. Roane State provided matching funds for the remaining portion. New fans at the Henry/Stafford East Tennessee Agricultural Exposition Center will help keep the indoor arena cool, making the venue more attractive for summer events. Installation was completed in mid-July. Officials hope the improvements will help lure horse and livestock shows and other events to the facility, commonly known as the Expo Center. In the past, exhaust fans on the east end of the 72,000-square-foot arena building drew outside air in through louvers on the west end, and exhausted it through the fans. That setup did little to offset steamy summertime conditions. Several events formerly booked for the Expo Center opted to go instead to other arenas in the area that have installed fans, Expo Center Director Stan Starkey said. “By putting in these fans, we’re hoping we can attract some of these shows back to our arena, as well as attract some new events in the summer months,” he said. However, since arenas are often reserved months and even years in advance, it will likely take a little while to refill all of the currently open dates on the event calendar, Starkey said. This fiscal year an additional state appropriation of $300,000 has been made that will enable the addition of a badly needed cover over the outside livestock holding pens on the east end of the main arena, as well as possibly adding more permanent seating in the arena itself. The Henry/Stafford East Tennessee Agricultural Exposition Center opened in May 1990 and is named for Jim Henry and the late Benny Stafford.